Each year thousands of students line up at all three dining halls across Boston University’s campus for one of the fanciest meals available at a college dining hall: lobster. Who would expect a college to serve lobster to its students for the cheap price of a swipe into the dining hall? I surely didn’t when I applied to BU. 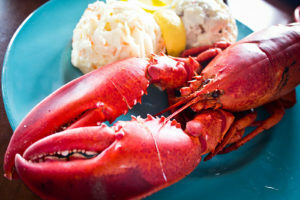 It seems to be a New England tradition to have a fresh lobster at least once a year, especially during the summertime. I’ve lived in New England for my entire life and I’ll be honest with you in saying that I had my first lobster at BU and it was an … interesting experience. I had no clue how to eat one, so I turned to the pros (my friends). One of them acted out the entire process of cracking off the legs and sucking out the meat and then the breaking off the tail — it was almost ceremonious. I’m the type of person who gets grossed out when my parents ask me to help clean raw meat or cut the rotisserie chicken — I’m not entirely sure why, I’ve just always been this way. So, when this day rolled around, I had to stop thinking about what I was actually doing and just do it. For Lobster Night, you may end up at a table with someone who is willing to do the dirty work for you, so look out for those pros. I’ve never seen so many people waiting in line for the dining halls; the lines wrap around the corners of streets, but once you’re inside, things move very quickly. BU provides bibs, melted butter, plenty of other foods and wet wipes for your hands. This has been a tradition for a while, so they know what they’re doing when it comes to boiling thousands of lobsters. If you’re friendly with the dining hall workers, you may even end up with an extra ticket to grab a lobster, these are friends that shall definitely go unnamed so that they don’t get in trouble. Even students who don’t live on campus look forward to Lobster Night, if they have underclassmen under their influence who can swipe them into the beloved dining halls. After all the ravenous students have had their fill and everybody clears out, the dining hall employees have a lot of cleaning up to do, I’m sure. Personally, I have been wondering if BU will ever consider serving a lobster taco the day after Lobster Night … do they ever even have leftovers, though? This year’s Lobster Dinner is on Wednesday, Sept. 13.